Salt Therapy is a natural therapy practiced for over 100 years. Relax in a Salt Therapy room filled with dry salt particles to help cleanse the airways and skin. Dry salt inhalation is a natural therapy discovered in the underground salt mines of Europe. Today, it has evolved into a modern therapy for cleansing the airways and skin. Salt therapy is the facilitation of dry salt inhalation within a controlled environment utilising Pharmaceutical Grade salt. A halogenerator measures and disperses a controlled and therapeutic level of microscopic salt particles into the air of a salt room. When inhaled deep into airways and lungs, the salt particles gently stimulate the body’s natural action of cilia movement. This natural process acts as a bronchiole brush, thinning out mucus and making it easier for the body to expel it along with pathogens and debris in the respiratory system. During a salt therapy session, the tiny salt particles also land on the skin. Exposing skin to the dry salt during a salt therapy session can help improve the skin’s protective properties and promote superficial bacterial flora (good bacteria on our skin) whilst reducing the harmful bacteria often present on the skin with skin conditions. Pharmaceutical grade salt is a natural anti-inflammatory and anti-bacterial. Salt balances Ph levels and stimulates the cell regeneration process. Moreover, the dry salt that is dispersed during a salt session interacts with the surface of the skin creating exfoliation. What happens in a Salt Therapy Session? A salt therapy session runs for 45 minutes. In our Adult Salt Room the lights are dimmed so you can sit back and relax in the comfort of our massage chairs. Some clients like to read, whilst others enjoy a period of quiet rest and relaxation. We have a dedicated Children’s Room with fun toys and a TV where parents can enjoy the experience with their child. We also have a Private Salt Room designed specifically for clients with conditions that require privacy. Salt therapy is a complementary therapy, designed to be used in conjunction with conventional medicine. Like many aspects of a healthy lifestyle, consistency is key and salt therapy should be viewed as an ongoing therapy to be utilised alongside conventional treatment. We always recommend clients speak with their GP about the use of salt therapy. To learn more about salt therapy, book in for a complimentary consultation with a Salt Therapist. Our communal adult’s room is a relaxation haven. Massaging recliner chairs, warm lighting and ensure a tranquil environment. Sit back and switch off, bring along a good book or listen to music - all while receiving the benefits of salt therapy. Our children’s room is like a child's delight, stocked with bean bags, toys, games, TV and a lot more. It’s fair to say that, most children receive the benefits of salt therapy without even realising it! 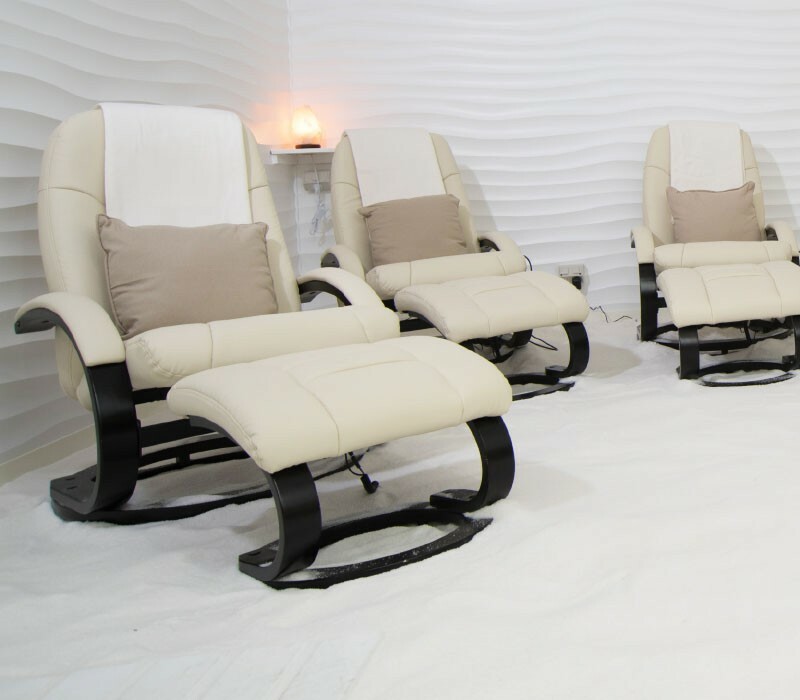 Our private room has been designed so people with skin conditions or compromised immune systems, can experience the maximum benefits of salt therapy. Like all our other rooms it’s designed with comfort in mind to help you unwind.